The Stainless Steel Partner Equo takes material handling in fields where cleanliness is essential to the next level. Primarily developed for usage in the pharmaceutical, chemical and food manufacturing industries, the Stainless Steel Partner Equo allows you to move materials throughout your facility in ways you never thought possible. To learn more about this manipulator, fill out the contact form on this page and we’ll be in touch shortly. 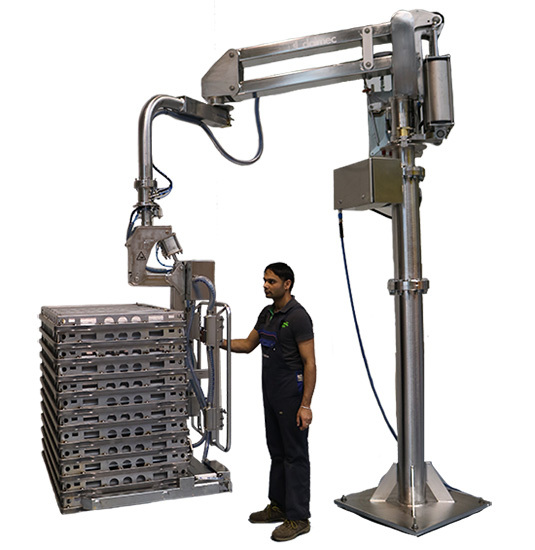 The Stainless Steel Partner Equo is able to move items with an off-set center of mass compared to the vertical axis of the manipulator’s arm. The modular structure has been designed to resist the torsion from stress and can also be used in particularly narrow environments. The manipulator is operated by a pneumatic cylinder fed with compressed-air, combined with a transmission lever system that provides balance to the load weight applied. Dalmec can supply the pneumatic manipulators in an explosion-proof version in conformity with ATEX Directive, suitable for the installation of the manipulator in explosion-risk environment classified as zone 1 or 2. The manipulators for the handling of bags and boxes equipped with electric pumps are also included. The certification is made in our plant by the qualified Engineer of a Notified Body according to the ann. IX 94/9/EC-ATEX Directive, which ensures the total conformity of the manipulator with the Directive.